When I was about 8 years old, my mom and dad called all four of us kids together, and in a serious tone, let us know that mom had breast cancer. I don't recall being upset; I figured that mom would go to the hospital, and emerge healed. I suppose that was due to being a child, and not having much experience related to cancer or death. My mom's attitude may have also contributed to my reaction and the calm mood of the family in general. She seemed to take the situation in stride and proceeded toward her hospital stay very matter-of-factly. Though I know she must have been frightened, I don't ever remember her being fretful. Mom did undergo a radical mastectomy all those years ago, and thankfully survived. Her sister, Auntie Helen, was not as fortunate and passed away from breast cancer in her mid-thirties, leaving behind her husband and two young sons. Our family of six was able to drive across country (California to Massachusetts) to visit Auntie Helen before she died. Though Mom prevailed against breast cancer, sadly twenty years later, she did succumb to ovarian cancer, and unfortunately, eight years ago my oldest sister did as well. Truly, they both fought with courage and hope throughout. Their examples are etched on my heart. These pink skeletons aren't meant to make light of a serious subject (we all know that cancer can be very scary), but to make someone smile or perhaps even laugh:) Laughter is the best medicine, right? Yep. These cookies are meant to bring attention to breast cancer, to preventing it, and to prolonging life. They're a reminder to do self-checks and have yearly mammograms! 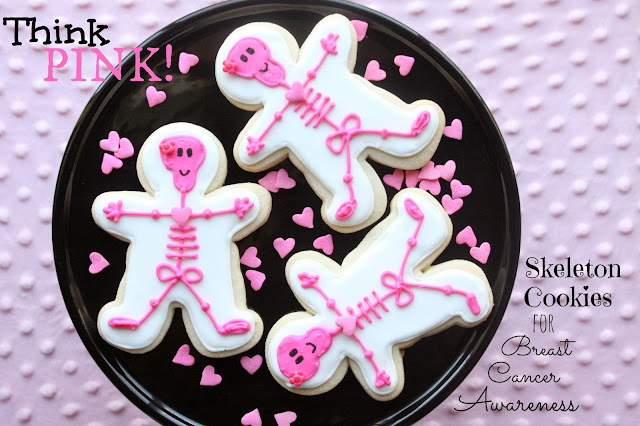 A big thanks to Michelle (Make Me Cake Me) for inspiring me with her "girly" skeleton cookies:) You must check them out! Heck, you need to check out her entire blog! 2. Use your gingerbread man cookie cutter to cut out cookie dough, and place on parchment lined baking sheets. 3. I placed my baking sheets in the freezer for about 10-15 minutes before baking, to help cookies hold their shape. 4. Bake cookies in a 350 degree oven for about 15 minutes. 6. Use a decorating bag fitted with a #3 tip and outline cookies in white royal icing. Let set for about 15 minutes. 7. Fill the cookie with thinned royal icing and let dry for a couple of hours. 9. Place a pink flower sprinkle to the head, and a heart sprinkle to the chest. 10. Let cookies dry overnight. 11. Using a black food marker, draw on eyes and a mouth. So sorry for your loss, Jennifer. Thanks for your kind thoughts. Thanks Brenda, and thanks for taking the time to comment:) Best wishes to your sister-in-law and friend! Sue, I am so sorry that it has been so prevalent in your family. Yes, it is a serious subject but I think anything pink we can do during October is wonderful. I love seeing the college football players wear pink shoes and socks and armbands during October! Thanks for your kind words and comment, Jacqueline. A very meaningful and beautiful post, Sue. I love those pinky treats. You need a bakery. You are that amazing. love them sue, what a nice way to remind people, or make someone going through hard times smile. Cute cookies with a powerful think pink message. I hope they find a cure for cancer soon so others don't have to go through what your family has gone through. Thanks for making us think pink today! Thanks for your sweet comment, Lisa! I'm so sorry to hear about your mother, aunt and sister. I think your adorably cute cookies would definitely make anyone smile which in turn would make them feel better. What a touching story and a great reminder of how precious we and those around us are. Those cookies are super sweet, I would never ever think you were making light of such a subject but bringing a smile to those around you - that is something I could see you doing. Ganz tolle Idee. Die sehen unglaublich lecker aus. OMG Sue these cookies are so cute! I have always wanted the skill to decorate cookies like this but I just don't have the patience for it! I'm sorry that cancer has taken the lives of your loved ones. I think we would we hard pressed to find a family anywhere that hasn't been affected by this disease in one form or another. You are right when you say that laughter is the best medicine and these cookies go a long way in helping to cheer someone up. Thanks for your thoughtful comment, Paula. Cute cookies - and what a great cause!